Foods with strong flavours and spices like fish or curry can often cause lingering odors in the kitchen. Fear not, as this smell is fairly easy to get rid of with five simple, inexpensive ideas. One of the most handy ways to minimize pungent cooking odor is to not let them enter into every nook and corner of your house. Closing bedroom and closet doors prior to cooking anything smelly or with strong flavours ensures that you won’t have to fall asleep in a bed that smells like fried fish. Also, make sure the kitchen is clean before you start anything. There’s absolutely nothing worse than waking up to a sink full of stinky oil-lathered utensils. 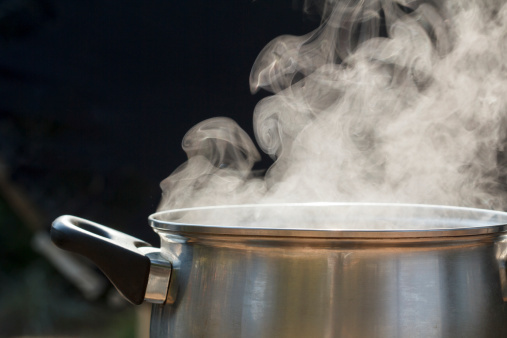 Wash and clean all your greasy cooking pans and pots as soon as you’re done using them. This will save your time and effort, or else the stubborn smelly grease will sit on your utensils. Drive out the foul smell as quickly as possible. For that, you’ll require, an exhaust fan or a chimney that can remove greasy cooking smells from the air. This is the most sane and easy tip to eliminate any possible foul odor. Toss smelly items like fish, vegetables or anything that will rot in a separate bag which can be disposed of outside. This works like a magic trick. All you have to do is, pour vinegar/baking soda in a bowl and leave it on the kitchen slab overnight. Vinegar tends to absorb stubborn odors.